Speaker Profile:- Ms Sutapa Banerjee has spent 24 years in the financial services industry across 2 large multinational banks and a boutique Indian Investment bank building and heading several businesses. Currently she serves as an Independent Director on several boards of companies in the JSW, IL&FS, Women’s World Banking Group, Oxfam. She is a Visiting Faculty with IIM Ahmedabad co-creating and co-teaching an elective titled ‘A Gender Lens on Corporate Policies’ - a first for any business school anywhere She also works as a Business Coach for senior leadership talent and consults in the Wealth and Investments area for the Gerson Lehrman Group Sutapa is an Advanced Leadership Fellow (2015) at Harvard University. 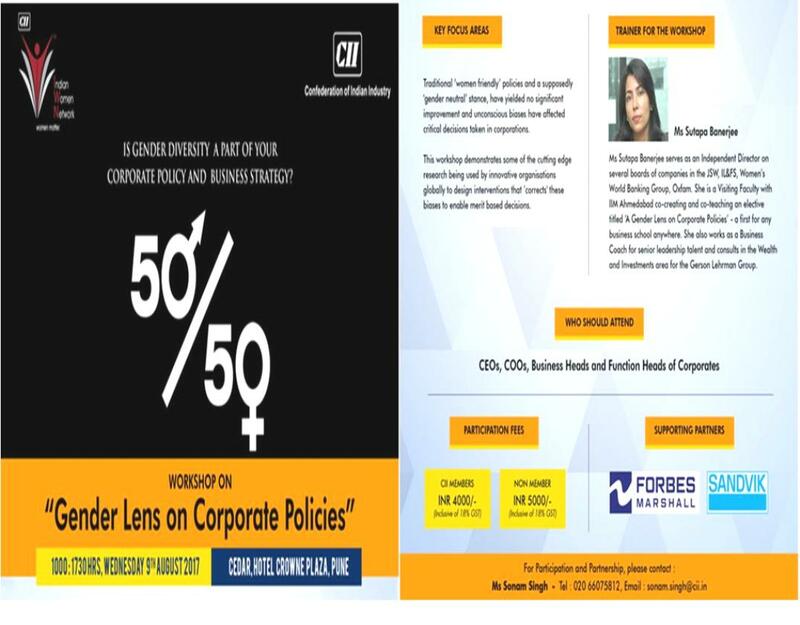 A member of the CII National Committee on Integrity and Transparency in Governance she also serves on the Advisory Panel of the ‘India Responsible Business Forum’ (IRBF).